Microsoft Corporation India Pvt. Ltd. has struck yet another agreement with a website, tying up its latest browser Internet Explorer 9 with Yahoo! Cricket, which will allow users to view latest match scores, team information, photographs and videos with the help of a 'Cricket Tab'. The tab can be created by dragging and pinning the Yahoo! 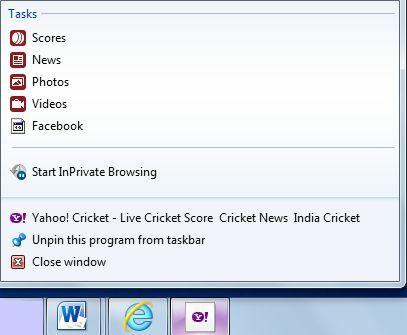 Cricket website icon onto your desktop taskbar. Once created, the tab will directly launch the window of window of Yahoo's online cricket website. Senthilkumar Sundaram, Director Internet Explorer, Microsoft India said, "For a nation where cricket is a religion, this partnership will provide cricketholics a richer web experience with Internet Explorer 9 and content from Yahoo! Cricket." Due to the jump list feature on Windows 7 and IE 9, users can select and then directly go to a specific page within the Yahoo! cricket site. They just have to right click on the cricket tab and then they can select whether to check out the latest match scores, news about individual players or watch cricketing videos. I. M.Swaminathan, Director, Consumer Product Marketing, Yahoo! India said, "This association is aimed at offering a compelling and unique experience to Indian cricket fans on Yahoo! Cricket. This will enable them to catch all the excitement of the game anywhere, anytime seamlessly"
With this partnership, Microsoft IE 9 now has tie-ups with more than 80 Indian websites. Globally, IE 9 was downloaded 2.3 million times in just 24 hours of its global launch and few days back the company had also launched its cloud offering Office 365 in India. Recently Microsoft India saw the exit of veteran Hemant Sachdev from the company. He had held the post of Joint managing director, consumer and online business, Microsoft India since 2008.